This album seems to have been characterized as fusion/crossover perhaps for marketing purposes but it is in fact a fine compilation of too little heard works by Afro-Cuban/Latin American/South American composers of the mid to late 20th century. 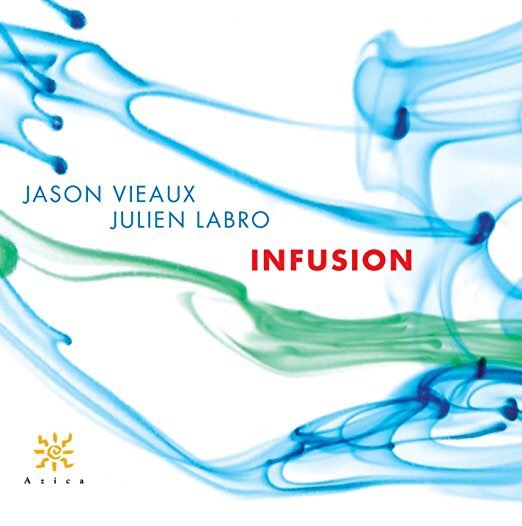 Start with the rapidly rising star of guitarist Jason Vieaux whose earlier recording of the stunning Ginastera guitar sonata seems to place him in the position as a specialist in Latin American music. Then add Julien Labro, a specialist in the bandoneón, an instrument best known for its ubiquity in tango music. Combine them with good audio engineering and an intelligent production and you have this album. If there is a sense of “fusion” here it is due to the creative efforts of the composers involved. In fact this is pretty much in the same tradition of Bartok, Kodaly, Copland, Thomson and others who mined folk and ethnic musics very successfully to infuse their “classical” compositions with new life. Leo Brouwer (1939- ), Radamés Gnattali (1906-1988), and Astor Piazzolla (1921-1992) are all composers deserving of serious attention but are little known in North America and the reasons are clearly not musical talent. All three composers are featured here in works arranged by Julien Labro who plays bandoneón, accordion and accordina on this recording. He is joined by Jason Vieaux on guitar, and Jamey Haddad on percussion. In addition we are treated to a composition by Pat Metheny and a curious arrangement of “Everybody Wants to Rule the World” by Roland Orzabal, Ian Stanley, and Chris Hughes to round out a diverse and engaging program. One hopes that this will kindle further interest in these too little known composers but, until then, we have a marvelously entertaining recording that will likely please Latinists, guitar lovers, bandoneón lovers, and the like. This is a fine and crisply recorded CD with some truly fine musicians. Call it fusion if that helps you want to listen but please listen when you get a chance. You won’t regret it.